Stinging nettle infusion spiked with mint and red clover found its way to my kitchen counter by chance this summer where its deep green, inky hue is now desperately loved. Yes, like most of you real food lovers, I’m a fan of the legendary herbalist Susun Weed. And though her Wise Woman Herbal for the Childbearing Year sits nestled between thePhysician’s Desk Reference for Herbal Medicine and Traditional Foods Are Your Best Medicine, I had never really put her wisdom to good use in my kitchen. Fresh nettles arrive every other week from our local CSA, and having only worked with dried, cut and sifted nettles, I had no idea what they were when I first encountered them. Gleefully, I stuck my hand into a bag of nettles thinking they were any other green (which spurred this post about what to do with mystery veggies in your CSA) and that, dearest real food lovers, was a grave mistake. It felt like a thousand mites were biting my hand and, yelping like a chastened puppy, I pulled my hand from the bag only to find it cover in little red welts. Fortunately, I mentioned my predicament at the local health food store where it was suggested that I probably am not allergic to those green serrated leaves at all as I had thought, but that they’re stinging nettle. And I promptly fell in love. Now, I’m not one to caution you about proper handling of foods. You’re grown-ups. Or, at least most of you are. But do wear gloves when handling fresh nettle. Trust me … me who foolishly didn’t know better. Stinging nettle infusion is potent medicine, particularly for women whose bodies crave the plant’s rich minerals like magnesium and calcium. And nettles are highly anti-inflammatory and rich in phytonutrients like rutin, which is also found in buckwheat. Traditionally, stinging nettles were used to ease rheumatic complaints and disorders of the urinary tract – and many modern herbalists recommend their use in conjunction with fresh raw milk (see sources) to ease seasonal allergies. Where to get stinging nettles: Stinging nettles often grow wild, but can be cultivated from seeds (see sources) for medicinal gardens. You can also purchase the dried herb online fromMountain Rose Herbs. Similarly, mint is also a source of deep nutrition which is why I grow at least four varieties in my little kitchen garden – many of which came from Seeds of Change as part of their sowing millions project which gave away over 100 million seeds this year. Mint is, like other green herbs, rich in antioxidants, trace minerals and vitamins. Traditionally, mint was used to ease digestive upset and that it does fairly well – a remnant of its traditional use is left with after-dinner mints which, sadly are often flavored with artificial ingredients rather than true, fresh mint or mint oils. Mint is also used for its faint sedative effects and it’s perhaps these two effects in combination – easing digestive upset and calming the nerves – that gives mint its rightful place in many traditional remedies for colic. Where to get mint: Mint is a culinary herb as well as a medicinal herb (learn more about the medicinal qualities of culinary herbs). Mint can be purchased as starts in most garden centers, but you can also grow it from seed (see sources) which provides you with more varieties from which to choose. Additionally, you can purchase dried mint online. Red clover is rich in minerals and is also a source of coumarin which, like most phytonutrients, offers benefits in miniscule amounts but can be detrimental when overly consumed. Coumarin is a blood thinner. Red clover also has potent antispasmodic effects and, for this reason, is traditionally used to treat coughs and respiratory conditions including whooping cough. It is also a source of isoflavones which offer benefits in small quantities, particularly for women, though are too often consumed in large quantities as soy. Where to get red clover: Red clover, like nettle, grows wild and in my area it covers the hillside. If wildcrafting the herb doesn’t suit your needs or it doesn’t grow where you live, you can purchase dried red clover online. The grassy, green flavor of nettles combine with the sweetness of mint and clover for a deeply nourishing infusion of fresh garden herbs. Bring two quarts of filtered water to a boil. 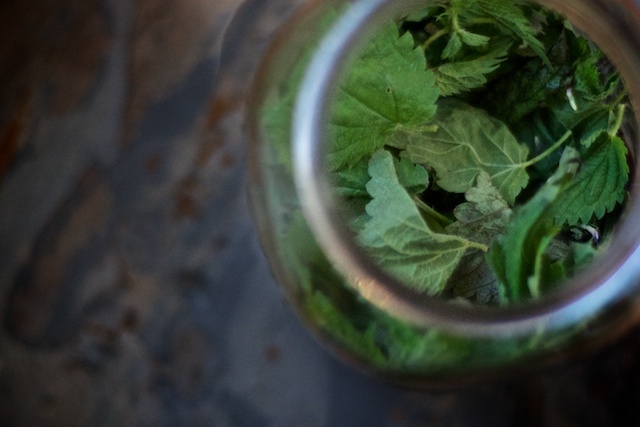 Toss nettles, mint and clover into a ½-gallon wide-mouth mason jar and fill with boiling water. Allow the herbs to steep in water for at least four and up to twelve hours, then strain them from the infusion using a fine-mesh sieve or tea strainer. Sweeten the infusion with honey as you like it and transfer to the refrigerator. Serve over ice. I have had run ins for years with stinging nettle while hiking, gardening and just working outdoors constantly cursing their invasion upon my hands. Oh and for future nettle stings I recommend glue on the area, let it dry, then apply duct tape and rippppppp! Out come the little hairs and kids really live this! I am glad to find a use for these plants. Wondering if there are any possible side effects? I work with children and would love to show them a way they can connect with the plant that we are always digging out of the school greenhouse. Nice to see I`m not the only one that loves nettles and mint. I start every morning with fresh picked nettles and mint from my garden adding greens which I pick different everyday. It may be Turnip, radish, collard, kale, dandelion ……. add it to my blender along with 1/2 a banana, bunch of frozen blueberries, kefir, flax seed, chia seed and some bee pollen. I don`t add any sweeteners. But you can add local raw honey. Yum! OH I do add a couple leaves of gotu kola. Here in Hawaii, we have a plant called “mamake” which is in the nettles family, but hairs do not sting. I have a plant in my garden and dry the leaves and give to friends. Maybe one can order plants from Hawaii, or maybe seeds from University of Hawaii. I make a refreshing summer cooler with mint and thinly sliced cucumber. Yum! Thank you so much for this post. My red blood cell count has been low and my Doc said anemia is the culprit. So I learned about stinging nettle and just bought a bunch. Thanks for teaching me how to brew it the right way. Nettles have the antidote inside them…..so you can chew them 🙂 I know, cringe…right? But true and hard to watch someone do. So if you get burned by the nettle, squish the stem and rub the juice on the area. 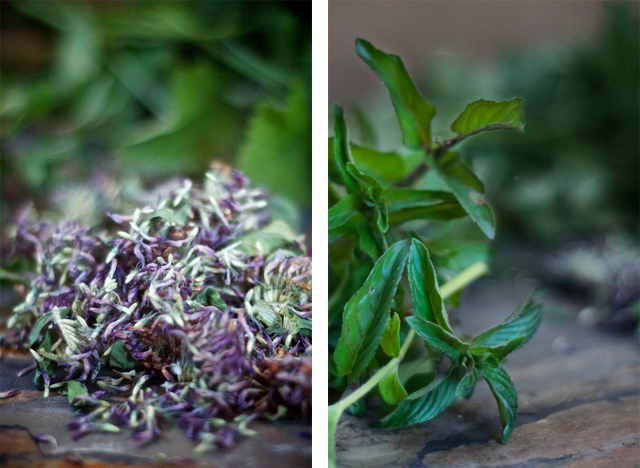 Susun Weed recommends dried herbs for herbal infusions.